This in spite of billions of pound investment in basically carpeting England with these privacy invading web of 24/7 data collection. This sounded like a stupid idea, was a stupid idea, and now proven to be both stupid and ineffective. This sort of use of technology is never effective. Look at this "terrorist watch list", its upwards of half a million people now. There are even Air Marshals on the list. Nelson Mandela is on the list, the guy is like 105 or something. It's just all noise and a complete waste of money. The billion of pound investment here doesn't include the other billion pounds spent paying police to sit on their arse's and watch the stupid things. 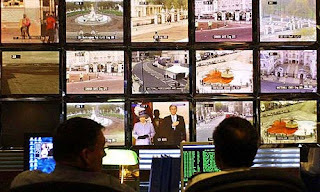 The scope here is incredible, virtually every inch of London is under surveillance.